Navy sweatshirt*, cardigan or fleece*. Black or grey skirt or pinafore. Black school shoes – black trainers are encouraged due to outside activities. In the summer a yellow or blue gingham dress or black or grey shorts are acceptable. PE T-shirt* in the House team colour your child has been assigned to – Blue, Green, Red or Yellow. Black pumps for indoor sports. Own trainers are more suitable for outdoor sports. Other items required for school include bookbags* and PE bags*. Swimming caps are necessary for any boy or girl in the relevant KS2 class with hair long enough to go in their eyes. Items marked with * are to include the school logo. All items listed can be purchased at our suppliers in Lancaster – The Uniform and Leisurewear Company. You can purchase school uniform in store at 15 Common Garden Street, Lancaster, LA1 1XD – this is opposite the bus stops at the back of Primark. They are open 9am-5pm Monday-Saturday and will have some later opening hours during August in the run up to schools starting back in September. You can also order online at www.ualonline.com or you can call them on 01524 388355 and speak to the store directly. All uniform needs to have your child’s name clearly written/sewn in as lost property is very hard to reunite with its rightful owner. 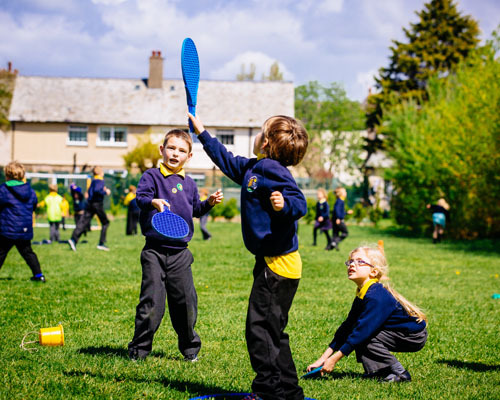 As we use our outdoor space regularly, it is advisable that your child has a coat in school for bad weather. We would prefer that children did not wear earrings in school. If they do, please ensure that they wear only one pair of studs that they are able to remove and replace by themselves for PE and swimming lessons. During the first 6 weeks, your child will need to be provided with plasters from home to cover the studs during PE lessons. Our advice is to have piercings done at the start of the summer holidays to avoid any issues during term time.